Do you remember our articles about the (round) 5 gallon buckets? We wrote about how versatile 6 gallon buckets could be wherever they are used. Whether it's at home, at the office, in the garden, at school, and even at the camp site, 5 gallon pails never stop being extremely useful. Well, you know what? If round 5 gallon pails can be THAT versatile, so can square 5 gallon buckets! You can use the square 5 gallon pails to do exactly the same jobs as the round ones. 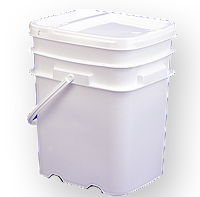 Our EZStor 5 gallon square buckets can be made a portable toilet as well as a camping light just like their round 5 gallon pails counterpart. With this trick you can make a square seating out of 5 gallon square bucket. You can definitely store your dry foods for a long time with the square 5 gallon pails, too – only better because the EZStor square pails have already come with their own matching lids. Then you can plant your tomatoes in the square 5 gallon container if you've got the green thumb. Travelers will most definitely feel the super versatile use of the 5 gallon square pails. And if you care about the earth's sustainability, you'll use them for organic and non-organic trash bins! It's endless when you talk about 5 gallon buckets. We can go on and on finding new things on how we could use both round and square 5 gallon pails. It's a matter of preference, really, whether you want to use the rounded shape or squared one. Of course one has more advantage than the other on a number of cases. But they are both highly useful. They are available in white color and include tamper evident tear tab strips lids. They also have a handle for easy carrying. 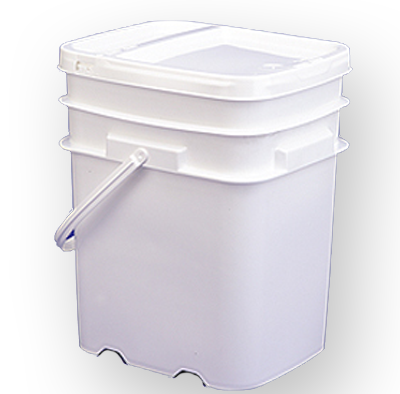 Approved by FDA, this square 5 gallon bucket is made of food grade material, making it absolutely safe for storing foods.